The March Artistic Outpost releases are now available! To celebrate this release, Artistic Outpost is featuring 15% off just about everything in their store**. Just use coupon code: spring2010_15 at check out, but hurry, this Coupon Code is only valid through March 31, 2010. 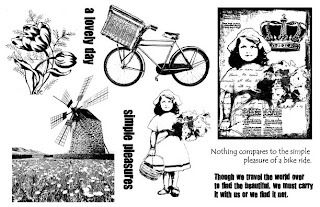 Inspired by the lovely country side of Holland, this collection features a Dutch bicycle complete with basket, a windmill that looks almost like a photo, but lends itself to coloring nicely, and an adorable little girl who is cradling a bouquet of flowers in her hands. Entire collection includes 9 images including multi-use quotations and sentiments. 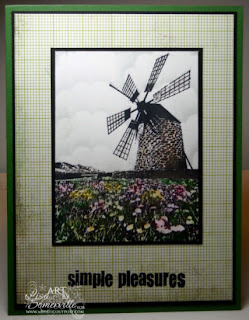 To create the card using Lovely Day, I used the Pastel Chalk Detailing Technique from a past issue of TJNL, it's a great way to add color to your images using Pastels. I added clouds to the sky using a punched scallop, sponge dauber and Bashful Blue ink. 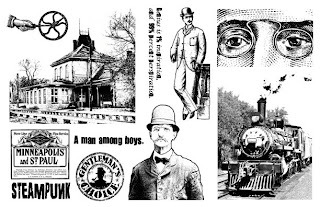 Featuring 10 masculine, Victorian era images, Steampunk is a fun and diverse collection. These stamps will be perfect for an altered, grungy mixed-media piece or a simple "Father Day's" card. To create the SteamPunk card I stamped the train image in Black Archival on Watercolor Paper, colored with the Marker Watercoloring Technique. Again, adding clouds to the background to fill the open space, sponging the edges in Soft Suede. 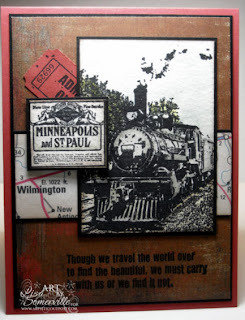 I stamped "admit one" from the Artistic Outpost Vintage Circus plate in Black on Red then punched with a Ticket Punch, I thought it went well with the train theme. The sentiment from Lovely Day is stamped in Black Archival on the Basic Grey paper. The piece of Map behind my image is from some scrap paper, but you could substitute this with the Map from the Artistic Outpost Route 66 plate. I sponged Old Paper Distress ink onto the map panel to age it a bit. love them both Lisa, wonderful job! Very cute cards Lisa, my hubby's Aunt would love that Holland set (she's from there) and her house is decorated in all of that. The windmill is very pretty. Love both of the cards. Those are some great new sets. Fantastic job as always!!! i like your steampunk creation. Lisa you are so talented, I love your creations. Great job girl!! fabulous cards Lisa, The first one has a little 3D effect to it. Fabulous! Both of your cards are fabulous Lisa. Great stamps. Loving both of those stamp sets, esp. after seeing your samples! Nice projects, Lisa! I really like the pearls with the little girl. WTG! Love how you added the ticket to your train design ... and the technique you used on the field of flowers really brought them to life. Fantastic designs.